NITRO Workflows by default sends emails using SendGrid service. This can sometimes cause mail delivery issues as SendGrid server IPs may not be trusted by receiving server. Also, mails originating outside of receiving server but with sender address of internal domain has chances of being considered a spam mail. 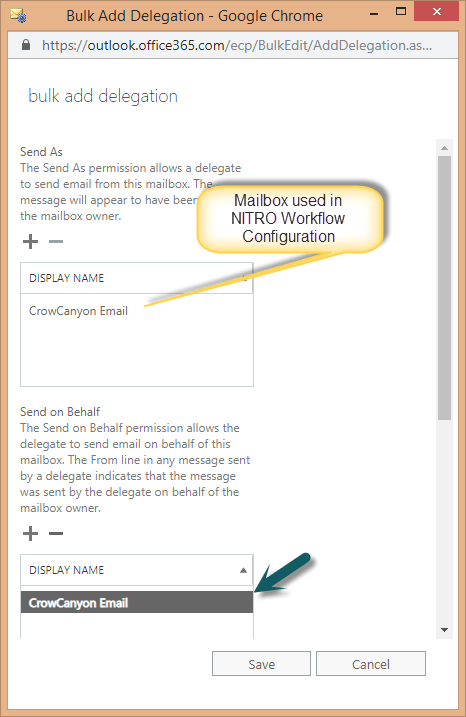 To avoid these issues, NITRO workflows now has the option to configure a mailbox to send mails. In case mail delivery by mailbox fails for any reason then SendGrid is used as backup. This can be configured at the site level in Workflow Manager. All workflows configured in the site will use the same mailbox for outgoing mails. 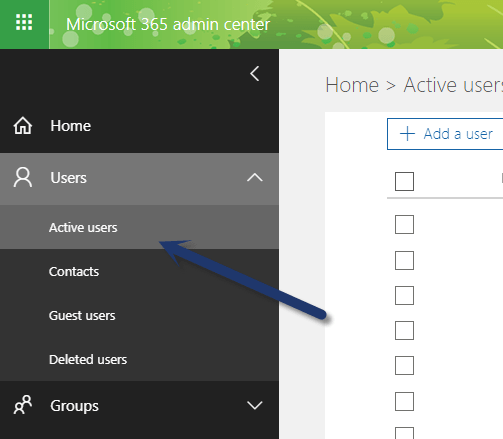 Configured mailbox requires permissions to send mails as another user or send mail on behalf of other users. Please refer this article for permission configurations. 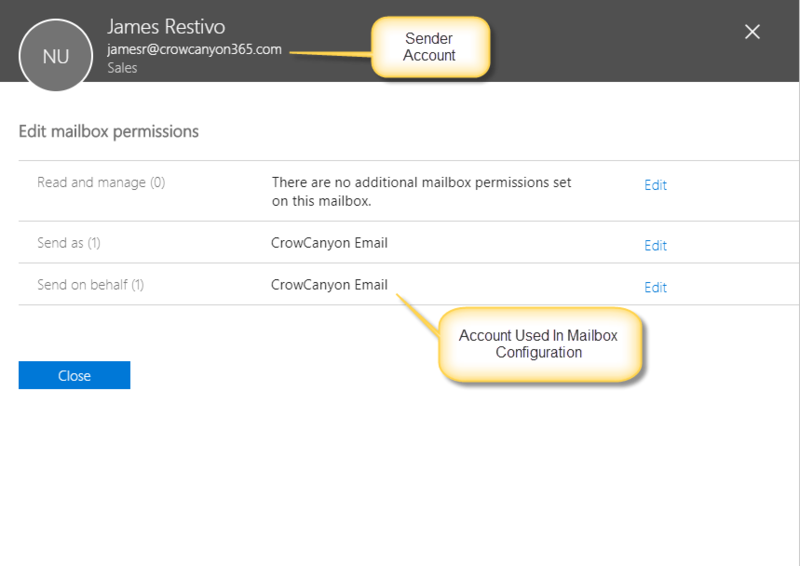 When above mailbox settings are enabled, Crow Canyon Workflow Manager component will attempt to send mails. This is done by connecting to the mailbox using Microsoft Exchange Web Services API. 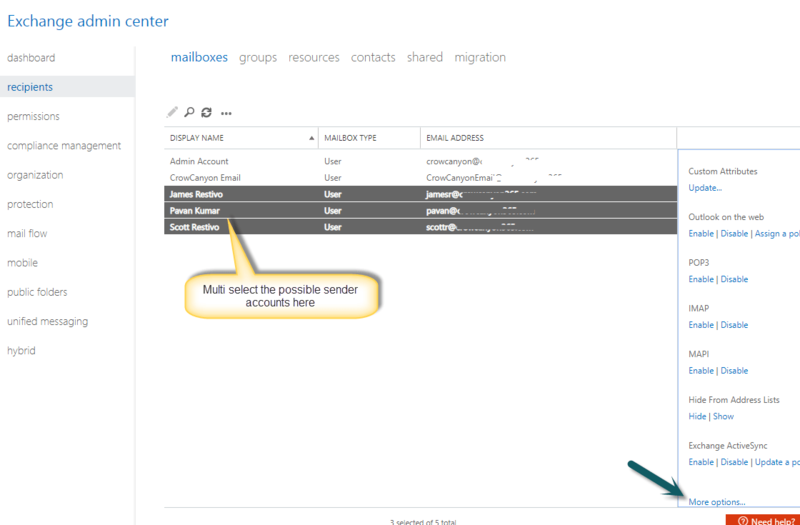 Workflow Manager component runs in Microsoft Azure and following IPs should be whitelisted so that mailbox can be connected for sending mails from the services running in Azure South Central US data center. Also, please ensure that multi-factor authentication is not enabled for this mailbox account. 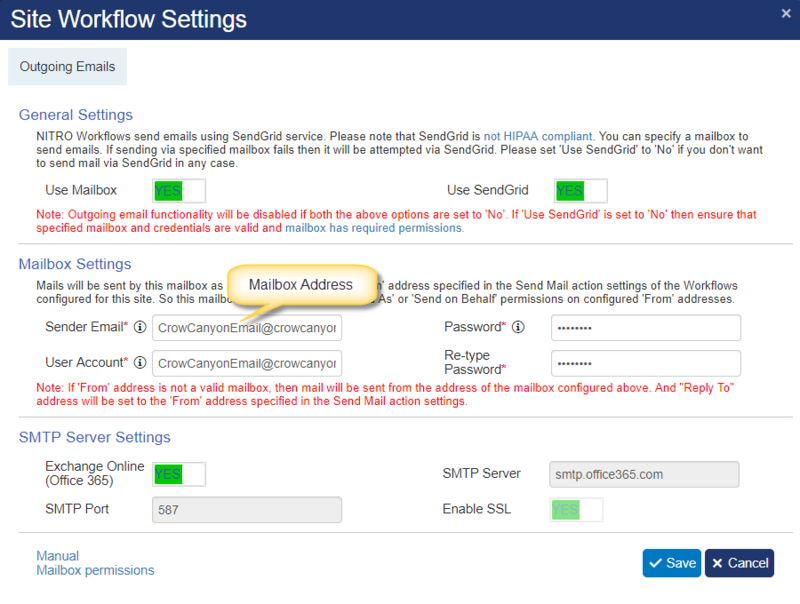 If above settings are not enabled, then mail is sent via SendGrid directly. If settings are enabled then first attempt is made to send the mail with sender as the ‘From’ address configured in the Send Mail action (‘Send As’ scenario). If this fails due to any reason like invalid sender account (no-reply@sharepointonline.com), then mail will be sent from the address of the mailbox configured above. 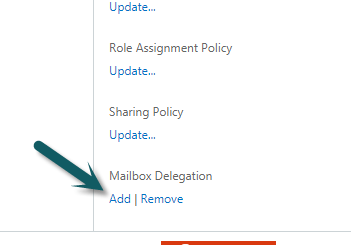 And “Reply To” address will be set to the ‘From’ address (no-reply@sharepointonline.com) specified in the Send Mail action settings. If both fail and ‘Use SendGrid’ is set to ‘Yes’ then mail is sent via the SendGrid service. 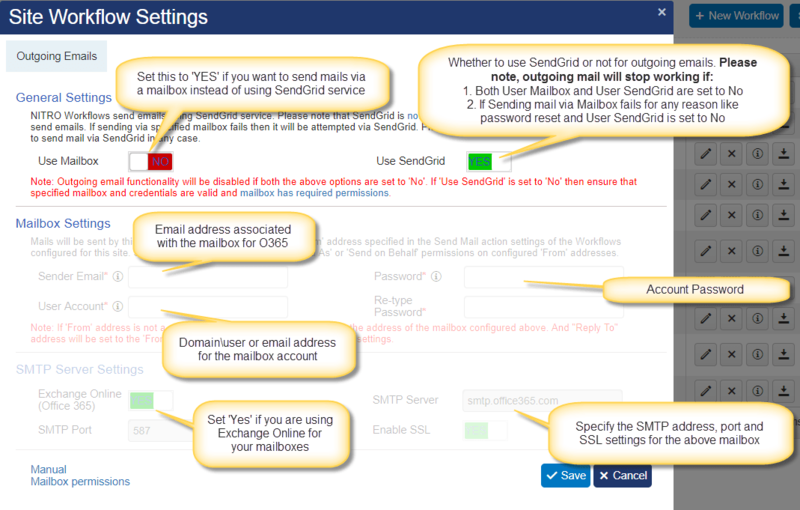 Please note that if ‘Use SendGrid’ is set to ‘No’ then outgoing mails will stop working if send mail via Mailbox fails or is not enabled. To grant ‘Send As’ permissions, please click here. 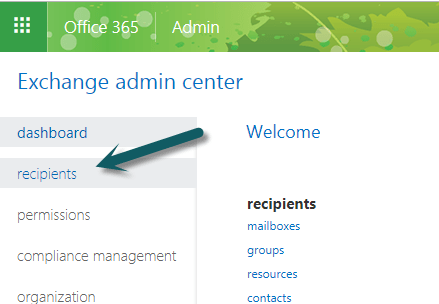 Note that we need to grant mailbox permissions to all user accounts for all the possible sender mail addresses. 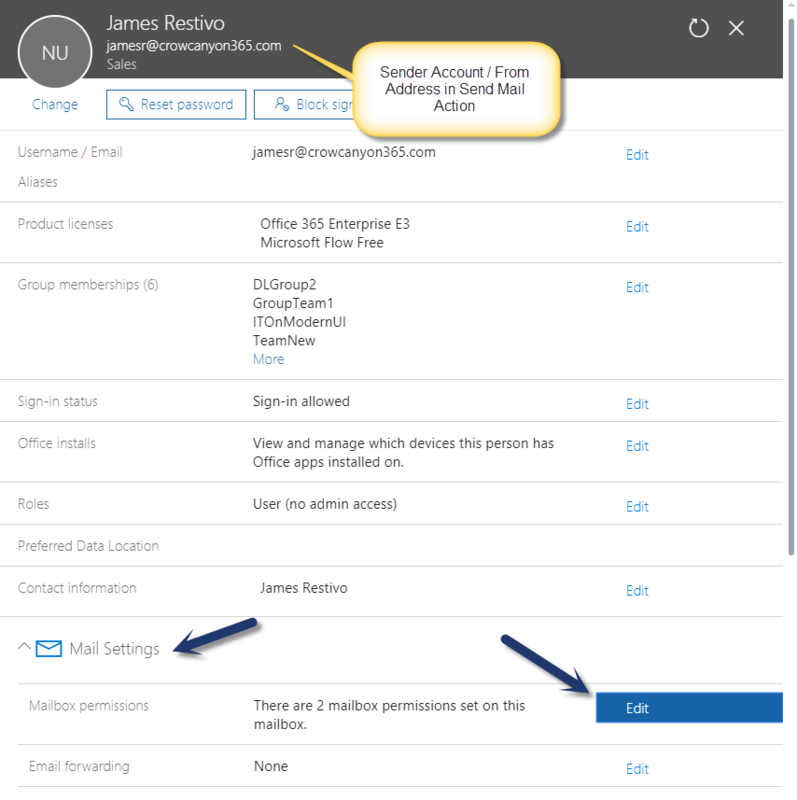 In short, mailbox account should have permission to send as the sender account (From address) configured in the workflow manager mailbox settings. ‘Send As’ as described above can fail for some reason, e.g. ‘Mailbox user’ not having permissions to send mail as ‘From address’ user. 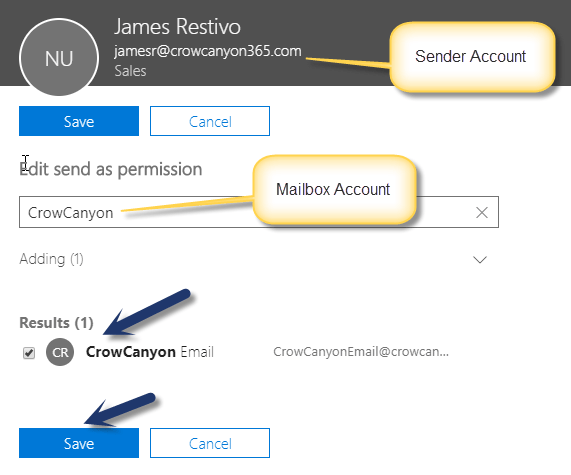 In this case, application will attempt to send mail with from address as mailbox email address itself (crowcanyonemail@crowcanyon365.com as per example above and not jamesr@crowcanyon365.com). In this case ‘Reply To’ address will be set as as the required sender address (jamesr@crowcanyon365.com). When user replies to this email, ‘To address’ in the reply will be set to jamesr@crowcanyon365.com. If both the above attempts fail then mail will be sent using SendGrid service. SendGrid will be attempted if ‘Use SendGrid’ is set to ‘Yes’. Else, mail will not be sent. Note: It takes around 15-20 minutes for the mailbox permission changes to take into effect.